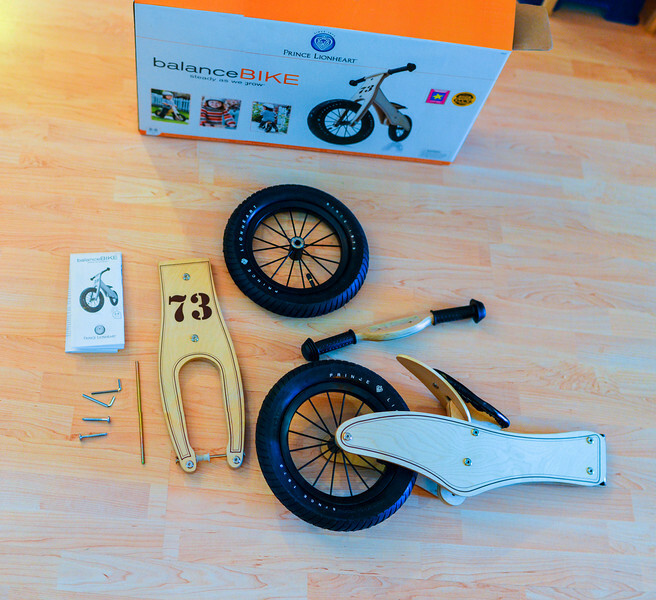 As you can see, the wee one was appropriately impressed by the bike, even in its unassembled state. Mommy and Daddy were excited about the compact, minimal packaging. Assembly was pretty straightforward: As shown, the bike comes in just 4 pieces and only requires two screws to be driven, one pin to be inserted, and one bolt to be taken apart and reassembled (to install front wheel). The instruction manual is completely pictorial but, because of the simplicity of the bike, very easy to follow. In addition, as you can see in the picture to the left, the handlebar is curved and has an inset on the underside, making proper installation more intuitive. I suppose you could mess it up if you really tried…but what parent has time for that extra effort? One important thing to take note of is that you will need a pump with either a very small head or a small head on a flexible hose in order to inflate the tires (because they will need inflation before use). Luckily, we had such a pump on hand, otherwise things would have gotten ugly fast. Picture that cute, happy excited little face from the video above with tears and a menacing scowl. *Shudder* I know –it’s scary. So, in order to avoid critical meltdown, make sure you have the proper bike pump type on hand BEFORE revealing the new ride. The only other negative of this bike was that the seat was a bit of a challenge to adjust. 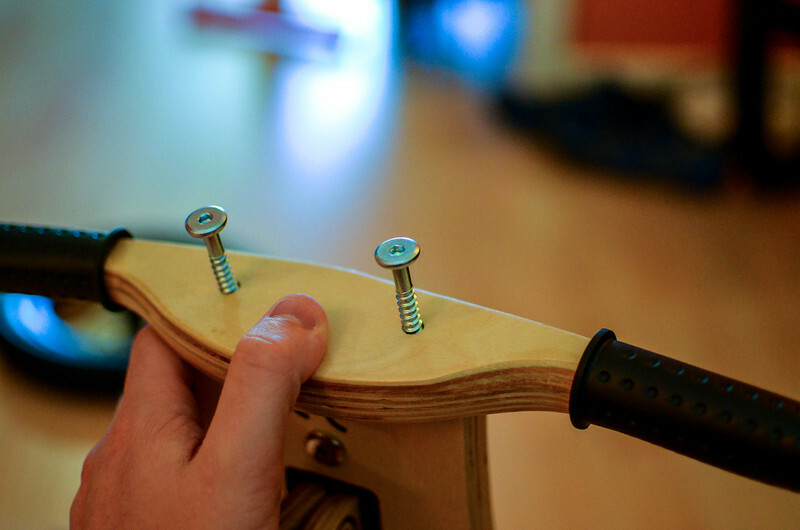 The placement of the seat screws necessitated using an Allen wrench on either side of the bolt and, shortly into this process, one of the bolts stripped and the provided wrench would no longer work. We were able to find a larger spare Allen in our stash of leftover IKEA wrenches, thereby averting another crisis. This wrench/screw issue could also very well have been a chance occurrence. I’d be interested to see if anyone else had this experience. Overall, we were quite pleased with this bike. I’d like to see it with an easier seat height adjustment. but honestly, for the price point (roughly $60 on Amazon.com), you can’t expect hydraulics, shocks, and push button adjustment, right? 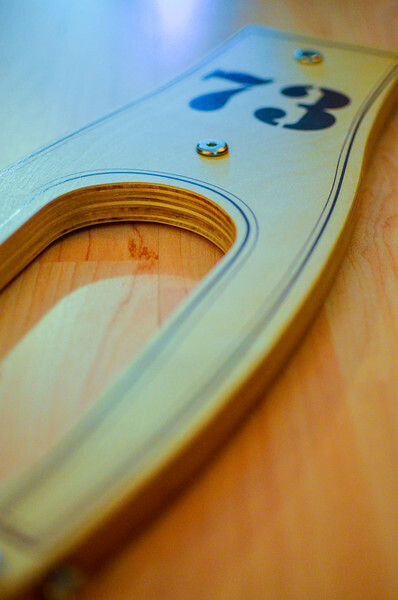 Also, we were quite impressed with the build quality. 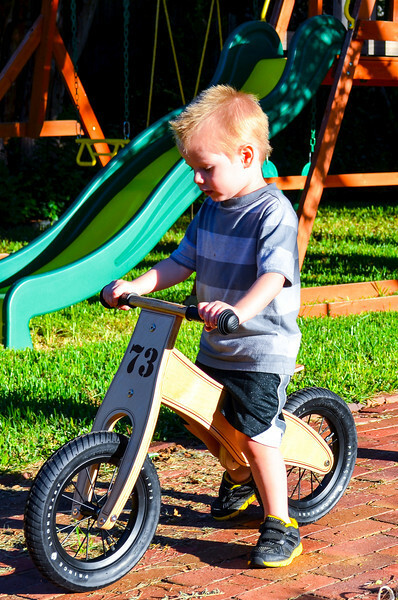 The 100% birch wood frame is very lightweight, the 12″ rubber tires provide decent traction, and the seat is nicely cushioned. That being said, and although I’m sure the wood is sealed well, I would not leave this bike outside. It is still a wooden bike, so I’d suggest protecting your investment by always storing it in a shed or garage where it’s safe from the elements. And there you have it. Keep the chicken nuggets off the bike, and you have a winner! As an aside, I’m sure you’ll notice in the above picture that Thing 1 is not wearing a helmet. We were, apparently, under-prepared and had not thought of the helmet aspect of a bike (duh! ), and he adamantly refused the one we had lying around. Hence, the backyard setting. Rest assured, we did not let him out into the world without proper protection. If your sweet darling is as opinionated as mine, it might be a good idea to take them to the store and let them pick out a helmet to ensure that they will wear it without inspiring World War Bike. Just a suggestion from one parent to another.